For any startup application seeking funding and mentoring, Startup Direct requires a business plan. It’s an excellent way to consolidate all of your ideas and get everything you need to remember in one place. 1. What’s your amazing idea? to develop this idea, the identified target market and a range of activities that will enable the business to apply for a startup loan for a new business, develop and to drive the business towards achievable goals that have been set within a specific time frame. 2. The money – show your bottom line! Secondly the business plan requires a healthy cash flow that clearly outlines both business expenses and the forecasted income, not only to cover all costs, but to ultimately achieve a profit to ensure longevity to the business. In this phase, entrepreneurs are required to be both realistic and to take into account all expenses, both foreseen and unforeseen, including VAT, and the entrepreneur’s wages. Cash flow forecast templates are easy to source and will help with the structure. 3. Startups can be all about the people, who are you? Any additional information about team members, their skills and how they can contribute to the business development will be an advantage. 4. What’s the five-year goal here? The plan should always have a time limit, usually it is either three to five years, which should suffice to develop all business activities to promote, grow the business and ultimately to achieve the first set of business objectives. Various types of business mentoring can be easily found to either structure your business plan or help you to grow your new business. 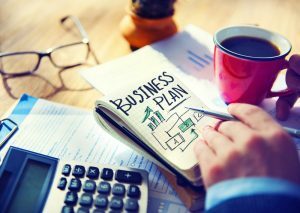 There should be three major parts to illustrate any startup business plan: a brief to explain the business idea, the business goals set and finally the vision; in other words how these goals will be achieved. The business plan should include a marketing plan, where it should be explained how the business will be promoted. Ultimately, a cash flow or profit and loss account should show how the money available will be invested, not only to cover all the costs and resources it requires to operate, but to ensure the longevity of the business.